Every once in a while I have some apples that are a bit soft and no one really wants to have them for a snack. 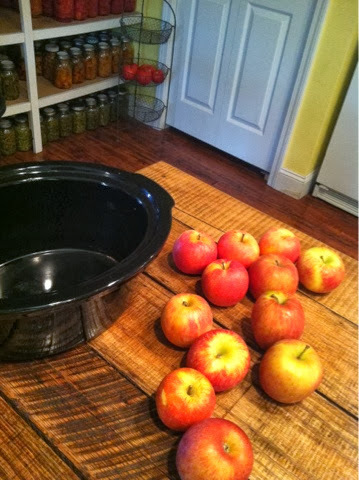 I've shared with you before that I often make applesauce or apple butter from these bottom of the barrel apples. I did that today, too. Except. I tried something new. A friend of mine and I were talking about cutting out some steps. So, what we talked about was, not coring or peeling! Because honestly, we know that peeling can be the biggest part of the work, right? Especially if one has MORE than a dozen or so apples. 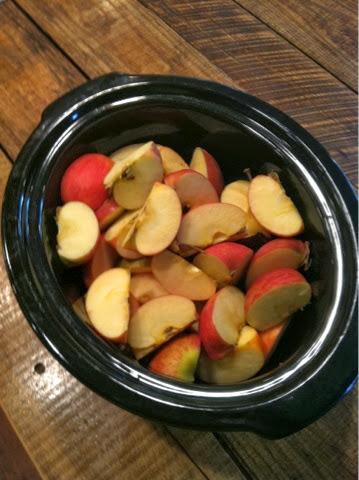 So, all I did was cut the apples up in quarters and throw them in my crockpot. I used the same recipe I always do for applesauce. I turn it on low and let it cook all night. 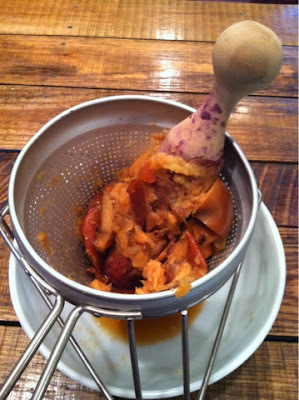 When I get a chance the next morning I scooped out a few of the apple quarters and put it through my food mill. You can see just how easily the apples 'smooshed'. haha Nice word, eh? You can also see the blackberry stains on my wooden pestle. 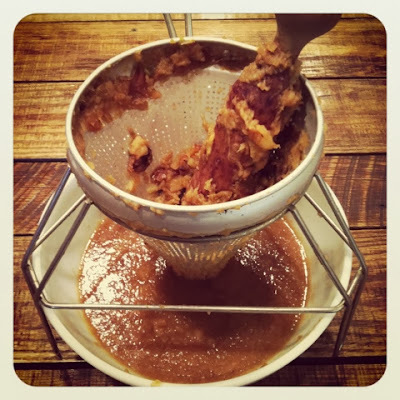 Just continue running your apples through your mill and letting all that sauce fill your bowl underneath! If you have made enough, you can easily fill some quart jars and hot water bath can it for 20 min. If not, stick it in the fridge and enjoy it with any meal or for a yummy snack! My food mill is different than yours, but that's how I do it too. It wastes less of the apple. Hi Kim! I don't have my rolls of paper packed in, so I have a bit of room to lean them over just a bit... I haven't had any trouble putting them in or getting them out. I can take another pic if I need to. It has a few inches in between the top of the wrapping paper and the top of the basket. Thank you so much, Chas! The fullness must be the issue - mine are taking up every inch of space! Maybe now that they are organized I can get rid of a few duplicates and put that other 10" to good use. Thank you for responding so quickly.